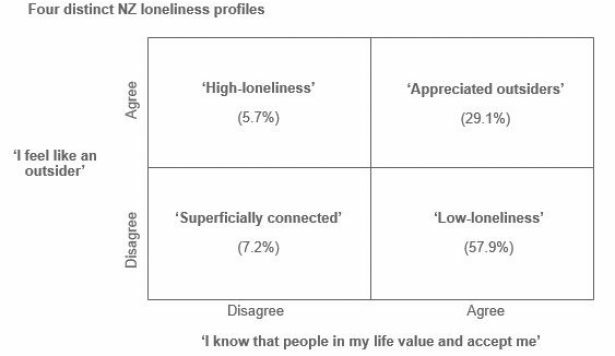 Conducted a Latent Profile Analysis (LPA) on 18,264 participants from the fifth wave of the New Zealand Attitudes and Values Study (NZAVS) to identify the number of distinct loneliness profiles in the population. Secondary analysis determined the wellbeing and personality characteristics of participants within each profile. Four loneliness profiles were identified, which they labelled: 'high-loneliness', 'low-loneliness', 'appreciated outsiders' (received acceptance from others but felt like social outsiders) and 'superficially connected' (felt like social insiders but didn't receive acceptance from others). "The ‘appreciated outsiders’ emerged significantly better off on all markers of wellbeing than the ‘superficially connected’. This would suggest that possessing close, meaningful relationships may be a more decisive factor in maintaining wellbeing than a sense of social inclusion." low self-esteem, low life satisfaction, low perceived social support, and high psychological distress), low extraversion, and high neuroticism. In contrast, the ‘low-loneliness’ profile had the opposite, with the other profiles ordered in between. While the loneliness profiles are ordered in the figure, they do not provide a loneliness spectrum due to the sharp discontinuity between the ‘superficially connected’ and ‘appreciated outsiders’ profiles. The NZAVS was not designed to evaluate loneliness and, as such, the measures do not capture the ‘attachment’ aspect of loneliness. Furthermore, the fifth wave of the NZAVS was not totally representative of the New Zealand population, with an over-representation of NZ Europeans (85.5%) and females (62.8%).